The Stingers fell short in a game they looked to be dominating early. Against a top opponent, they simply could not get their offence clicking. It started off looking like the Stingers might be in for a repeat of their last game against the visiting Ottawa Gee-Gees, a hard fought, tight, entertaining win. The Stingers outshot the visitors 12-6 through the first and spent the opening frame making Ottawa goaltender Anthony Brodeur live up to his famous father, legendary New Jersey Devils goalie Martin Brodeur. They ended the period with no score and even though they knew they were carrying the play, the Stingers knew there had been missed opportunities and chances close enough they should have been finished. “The power plays we had in the first period could have been a game changer. If you can put one or two pucks in the net on those chances, it’s a whole new game,” said Gosselin of the numerous chances the team had on the man advantage early in the game. Perhaps that should have served as a warning sign. The second period was one marked by “mental breakdowns,” as Stingers forward Philippe Sanche described them. 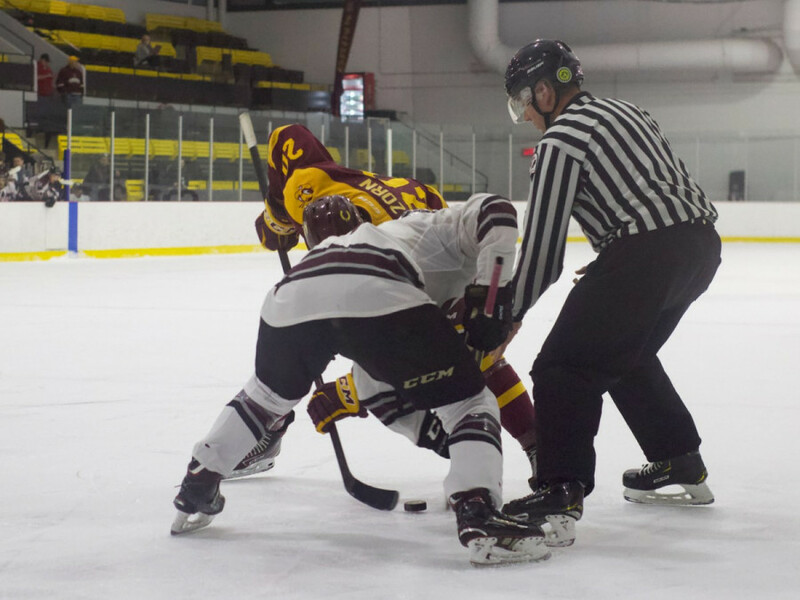 The Stingers were heavily outplayed in the second frame, even if the scoreboard only showed 1-0 by the end of it. Mistakes, missed queues, and moments of weakened pressure cost the Stingers chances and sent the momentum soaring the other way. “We didn’t execute our breakouts properly, we didn’t communicate well. We had so many turnovers, we have to limit the turnovers,” explained head coach Marc-André Élement. The pattern of strong start followed by breakdown would repeat itself to end the game, but not without an awkwardly long pause in the interim. What is usually a 15 minute intermission between the second and third period lasted just under an hour this time around. 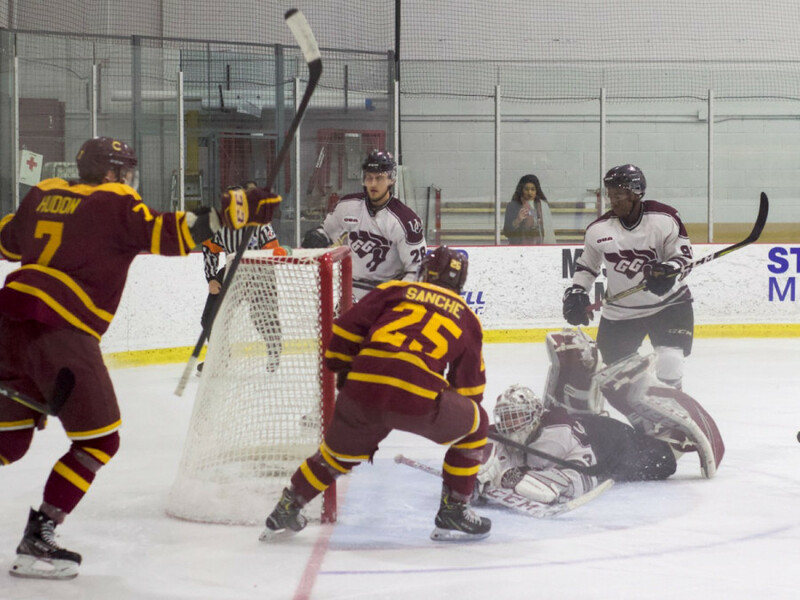 With one second to play in the second frame, defenceman Simon Bourque laid a heavy hit on a Gee-Gees forward, dislodging a pane of glass that took an extremely long time to replace between periods. The Stingers enjoyed needling and congratulating Bourque on the hit in the locker room for a chunk of the 56 minute break. Both teams tried to keep their legs loose and ready to play at a moment’s notice for when the game was able to resume. When it did, it looked to be all to the Stingers advantage. Philippe Hudon led two strong rushes, ringing his first attempt off the post just 30 seconds into the period and earning an even better result on the power play less than a minute and a half later. As he drove the net, he took a low shot as his linemate Sanche buried rebound to tie the game at one. The first eight minutes or so of the third were what the Stingers we’re looking for. The coaches were happy, but it didn’t last long. “We played two good periods, maybe one and a half,” said Sanche. More moments of mental breakdown cost the Stingers two more goals before an empty net marker sealed the deal at 4-1. Late in the game, it felt like while the Stingers may have had chances, it was Ottawa that was in control, showing why they’re a top five ranked team nationally and leading the OUA East. The playoffs are just three games away now as the Stingers face off against three opponents all vying for top playoff seeding.